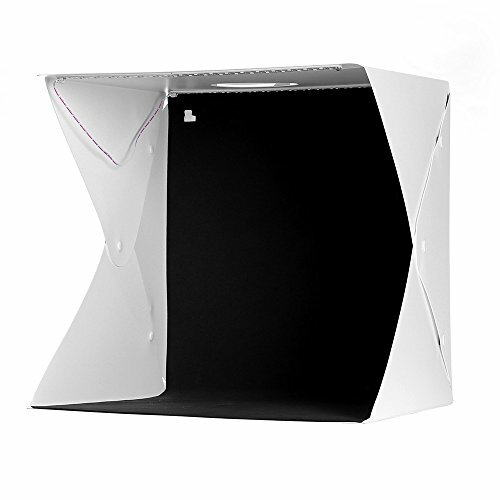 Adopted the premium PP material, our photo tent is water-resistant and anti-flaming. Besides, you can keep it clean and neat by using a wet cloth to wipe it directly. There are 2 LED light strips along the top of the tent, emitting the soft and average light, and you can choose to open one or two light strips according to your needs. Designs a single switch button to control the LED light strip, convenient to operate, meeting your need for high-quality shooting. Includes 4 background cloths in 4 colors (black, white, green, and red), which provides you with removable backgrounds, helping you produce beautiful and professional pictures. With the built-in magnetic buttons, you can fix it or fold it easily and quickly, enabling you to take it anywhere without any hassle.